The wonderfully fun and informative SCIENCE COMICS series, which has brought us exciting topics like coral reefs, dinosaurs, and volcanoes, is about to get a new addition: Bats: Learning to Fly. Infusing storytelling with sidebar information, author Falynn Koch tells the story of Little Brown, a bat who loses his way and is swatted away by a human and injured as the bat tries to feast on bugs. As we follow him to a rehabilitation center where he gets to know dozens of other bats and how he is similar and different from them all. A lot of information is packed into this graphic novel. Little Brown’s journey allows us to learn about bats from all over the world, the dangers bats face from their environment and humans, how they help control insects and spread seeds, and how humans can be helpful and not harmful to the bats around us. Sidebars throughout the story, identified easily by different color backgrounds, give direct information related to Little Brown’s story. At times, the sidebars can be confusing to children unused to following graphic novel layout, but readers will quickly acclimate to the format. Highlights in the book include sections about the Bracken Cave colony and the Congress Avenue bridge, both in Texas. The illustrations of various bat faces is fascinating, and you’ll catch readers returning to the page again and again. Little Brown’s realistic personality (sometimes vulnerable and inquisitive, other times defensive) will help readers relate to his journey and the things he learns. Readers will learn about bats’ wing structure, use of echolocation (they don’t all use it! ), where and how they sleep, how bats use their bodily functions to help grow trees and plants, and how they are able to stand being upside down for so long. There is plenty of detail for the casual bat fan as well as the bat aficionado. And besides that, there is a fun story for kids to follow. Humans as a danger to bats is emphasized (although cats are a close second), but solutions are offered that will make us all better friends of bats. Tips are shared for hikers, homeowners, and tourists, and the end of the book gives great ideas about making or setting up your own bat box. Did you know that hikers can fool hibernating bats into thinking its spring merely by exploring a cave? As with all the Science Comics books, there are suggestions for further reading and a glossary of important terms. This newest version, Bats: Learning to Fly, is a wonderful addition for its sense of humor, creative approach to learning, and reliably detailed and beautiful illustrations. 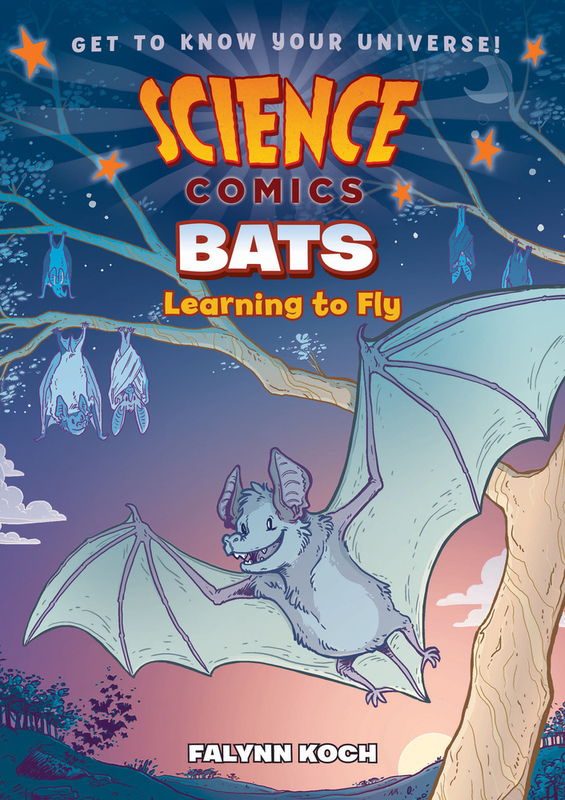 Bats: Learning to Fly, along with the entire Science Comics series, is highly recommended for ages 8-12.